DECEMBER 28—Chantel Malone walked away the 2013 BVI Sr. 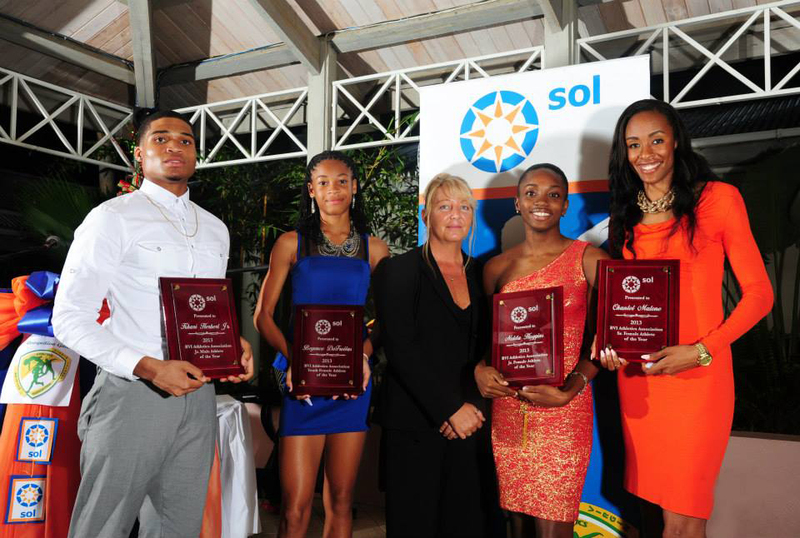 Female Athlete of the Year award presented by Sol, during the 5th BVI Athletics Association Athletes Awards Gala at the Moorings on Friday night. Malone who established a National Record with her Long Jump leap of 6.65m during the inaugural Chris Brown Invitational in Nassau in April, picked up the award for the second time after taking the Sr. laurel in 2011. She was also the 2009 & 2010 Jr. Female Athlete of the Year. Malone was one of three athletes qualifying for the 14th IAAF World Sr. Championships in Moscow, where she placed 21st in her pet event. She is ranked among the top 40 Long Jumpers in the world and 3rd in the Central American and Caribbean region at season’s end. The Sr. Male Athlete of the Year recipient was Shot Putter and Discus Thrower, Eldred Henry, who recorded bests of 18.01 and 55.45m respectively. Sprinter Nelda Huggins—a two times Youth Female Athlete of the Year in 2009 and 2011, collected her first Jr. AOY honor, after running personal bests of 11.77 and 24.24 seconds respectively in the 100 and 200m. She earned Carifta Games 100m silver and was an IAAF Youth Championships semifinalist in both sprints. Her 11.77 time is a new Natonal Jr. Record. Khari Herbert Jr., who ran a personal best of 47.21 in the 400m, repeated as the Jr. Male Athlete of the Year. CAC Age Group Championships 11-12 Girls individual bronze medalist Beyonce DeFreitas, was the Youth Female Athlete of the Year. DeFreitas also won a 60m silver and Long Jump bronze at the CAC Age Group competition. Koen Penn repeated as the Youth Male Athlete of the Year. Sol also doled out awards recognizing athletes in individual events and relays who established National Records during the season. In other awards, Keron Stoute picked up the inaugural LIME Collegiate Athlete of the Year award, by virtue of winning the MEAC Indoor Championships Heptathlon. He was second in both the MEAC Outdoor Championships Decathlon with a personal best of 6108 points and cleared 2.06m in the High Jump. Quarter milers Kyron McMaster and Dominique Maloney, were the Most Improved Male and Female athletes, while J’Nae Wong—who lost time during the season to a foot injury—then returned to win a 13-14 Girls 80m silver medal at the CAC Age Group Championships, was the Colonial Insurance Comeback Athlete of the Year. Sprint Tech Track Club’s Willis “Chucky” Todman and Top Notch Track Club’s Winston Potter, were the BVI Athletics Foundation Co-Coaches of the Year. Former National Record holders in the 800/1500m and Shot Put and Discus Throw, Dale Abrahamson and Gene Hodge—both of whom were on the first team to represent the territory just two months after the BVI Athletics Association was formed on September 19, 1970—received the association’s Lifetime Achievement Awards. MB’s Ice and the Dept of Information Technology were also recognized for their respective contributions to the association. Following are the 2013 BVI Athletics Association award recipients. 2013 BVI Athletics Association Jr. Male Athlete of the Year—Khari Herbert Jr.
2013 Most Outstanding Boys Under-20 Track Athlete— Khari Herbert Jr.